As I’ve raved about before, Avec Eric, the new PBS show with chef Eric Ripert, is proving to be great food TV. It didn’t take long for me to want to test out one of his dishes and see if what looked simple was simple, or just evidence that he’s got a production team as brilliant as he is. 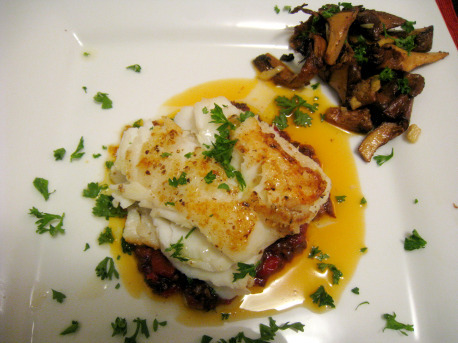 The dish that looked both simple to make and delicious was his cod basquaise, featured in episode 4, Birth of a Dish. Basquaise, as he describes in the show, is essentially a pepper marmalade. In addition to the chopped red pepper that’s sauteed down in olive oil, onion, and garlic to “almost melting”, as Ripert puts it, there are two other major stars to the dish. Chopped serrano ham adds a separate element of fat and a salty, bacony flavor about which I don’t think I need be Clarence Darrow (or Henry Drummond) to convince you is a good thing. The most interesting ingredient of all, however, considering the basquaise was being plated below a piece of tender, white, cod, was red wine. This goes in the pot at that crucial moment just as you think what you already have is delicious and perfect enough to eat straight out of the pot. Take the leap of faith, and in goes the wine. Of course, you’ll need to cook off the alcohol, but I admit being a tad nervous that I added too much wine. Which brings me to the general quandary I had with making this dish. What the hell was the recipe? In reality, it’s so simple you don’t need a recipe, assuming you take notes while watching the episode. But referring to the recipe would be easier than writing down the steps yourself, right? Right. Except that the recipe on the Avec Eric website doesn’t correspond exactly with what Ripert cooks on the show. In the end, I did question whether I added a little too much red wine, because the color of my basquaise was darker than Ripert’s. So, I might tone that down next time, but the flavor, once reduced, was amazing as is. What a simple-to-make, yet complex, layered component this basquaise was. By the time the flavors came together, it paired well with the cod without even coming close to overpowering it. I served the cod with some fresh chanterelles, actually the first time I’ve cooked them. I thought it might make a slightly meaty, substantial side dish, and it did. The lack of butter (we were all out) was a good thing, because its own flavor was able to shine. I’ve eaten these before, but after preparing them in this simple way, with only the oil, salt, and fresh parsley, I think I see why some people consider them the king of the mushroom. 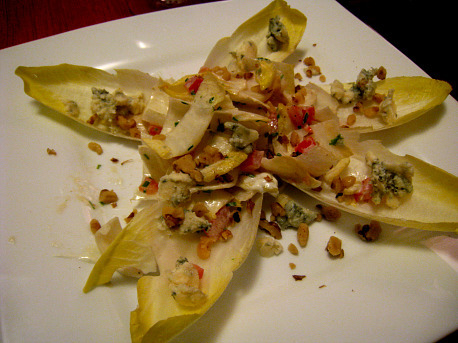 Along with the dish (I never manage to serve a salad in advance of an entree), I picked out the endive and roquefort salad from Ripert’s Le Bernardin cookbook. Something happened on the way to the plate. But it still tasted pretty damn good. I’m making it a point to describe the salad after you see the photo, because my plating skills aren’t winning any awards with this one. This is definitely a salad I will make again: simple, but impressive for several reasons. For one thing, there are two separate dressings, a vinaigrette that coats the chopped endive in the middle, and a roquefort cheese and sour cream mixture as a nice surprise in the center underneath everything. (I would also drizzle the vinaigrette on the outer leaves next time.) A sprinkling of additional roquefort and toasted, chopped walnuts help make this a salad that will inevitably be too small anytime one serves it. Yum. Looking forward to more Avec Eric testing. I like that. “Testing” makes me sound so productive. 1 cup tomato—— Look closely at the cutting board and you see a pile of red tomatoes and one tomato disappers. I followed this receipe and my wife said “you can do this again”.